"This book, one of the most frequently cited works on Martin Heidegger in any language, belongs on any short list of classic studies of Continental philosophy. William J. Richardson explores the famous turn (Kehre) in Heidegger's thought after Being in Time and demonstrates how this transformation was radical without amounting to a simple contradiction of his earlier views." "In a full account of the evolution of Heidegger's work as a whole, Richardson provides a detailed, systematic, and illuminating account of both divergences and fundamental continuities in Heidegger's philosophy, especially in light of recently published works. 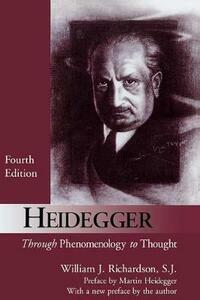 He demonstrates that the "thinking" of Being for the later Heidegger has exactly the same configuration as the radical phenomenology of the early Heidegger, once he has passed through the "turning" of his way." Including as a preface the letter that Heidegger wrote to Richardson and a new writer's preface and epilogue, the new edition of this valuable guide will be an essential resource for students and scholars for many years to come.